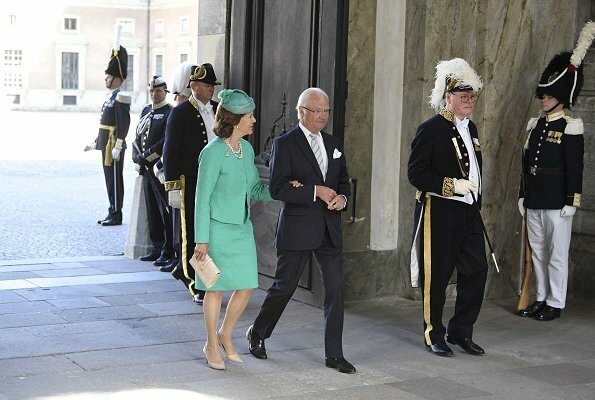 King Carl Gustaf, Queen Silvia, Crown Princess Victoria, Prince Daniel, Prince Oscar, Princess Estelle, Prince Carl Philip, Princess Sofia, Prince Alexander, Princess Madeleine, Christopher O'Neill, Princess Leonore, Prince Nicolas, Princess Birgitta, Princess Christina, Princess Désirée and Countess Marianne Bernadotte attended a thanksgiving service (Te Deum) on the occasion of The Crown Princess Victoria of Sweden's 40th birthday celebrations at the Royal Chapel on July 14, 2017 in Stockholm. He is not hugging his mom. He wants to be picked up! Normal for a toddler of that age. His is frighten. 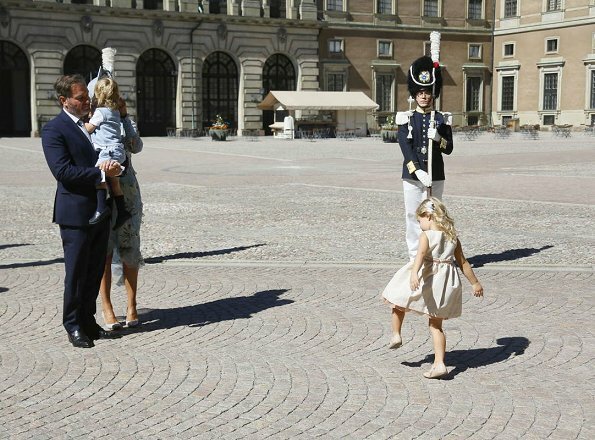 Happy 40th Birthday to Victoria Ingrid Alice Désirée, Crown Princess of Sweden! 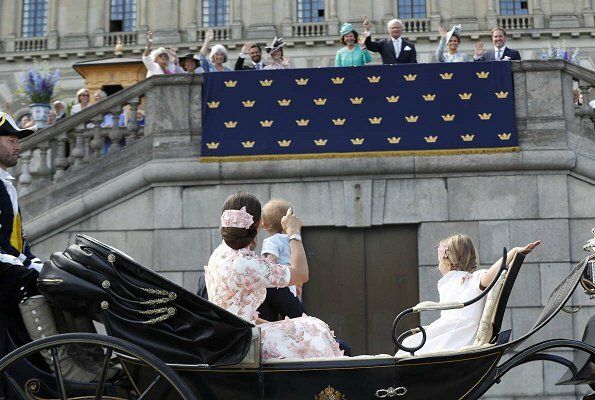 All royal ladies looked very pretty and elegant. Its good to see that the older they get, the more lovelier they seem to become. Liked their dresses very much. Everyone looks great! I love the dresses. It is so beautiful they are religious and thankful. Leonore looks so cute with flowers in her hair and Oscar is adorable. 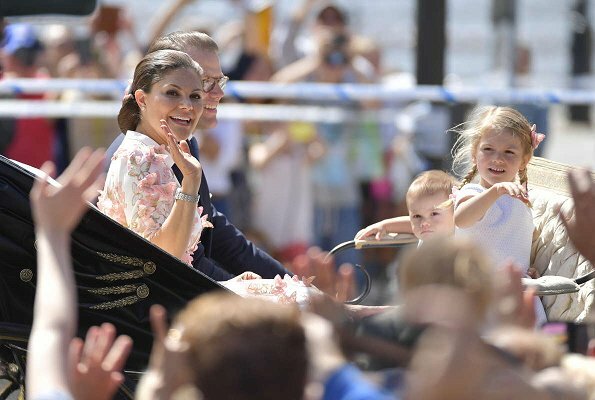 Parabéns à Princesa Vitória pelas 40 Primaveras :)). The kids are the stars of the show here. Totally adorable, all of them. 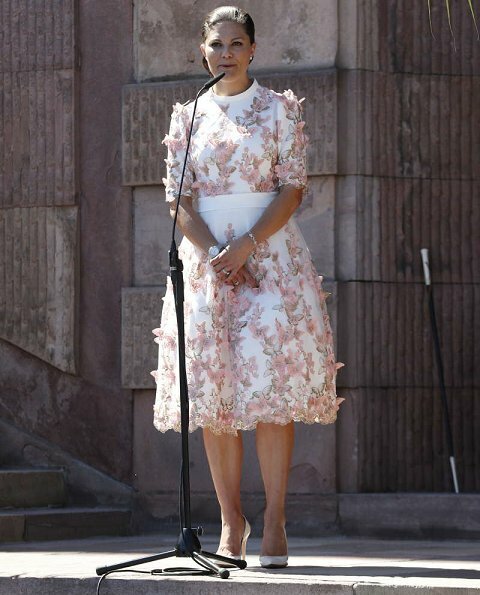 Victoria looks wonderful, very beautiful dress, although I would have liked it to be a few cm shorter. Chris looks like he got a (long overdue) haircut. Good for him. 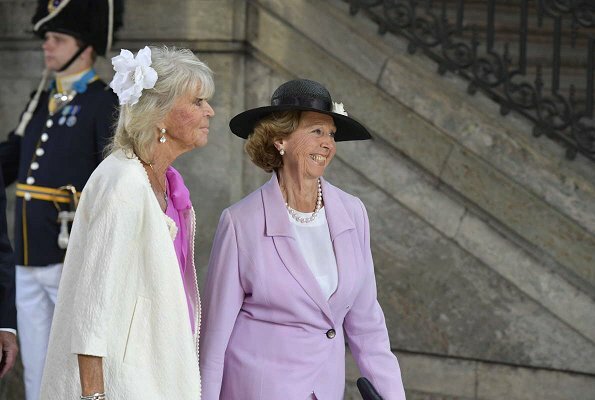 I don´t care for Sofia´s look or Madeleine´s. This makes my day. Can't wait to see more pictures from the weekend's festivities. Victoria est tout à fait sublime. 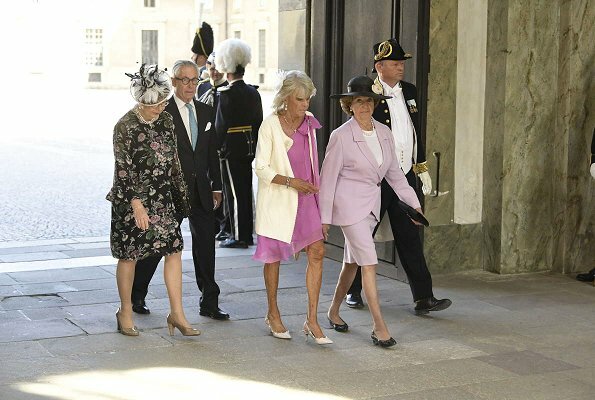 J'aime aussi les autres tenues sauf le chapeau de Sofia. Beautiful family. All of them. A pleasure to see the children. 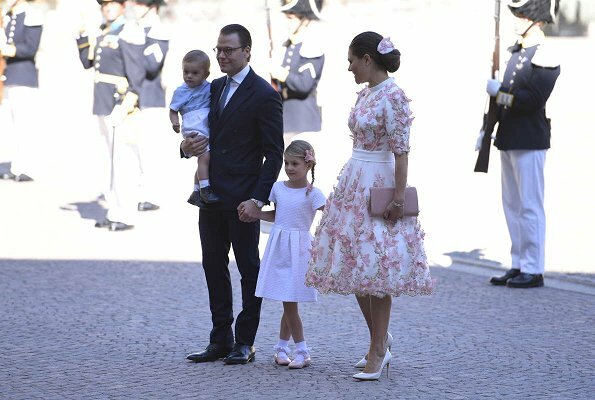 Victoria's dress is particularly romantic and summer-lovely. Happy Birthday to her! Wonderfull to see all looking so happy togeather. Vicroria looks stunning! Love the dress and up-doe. 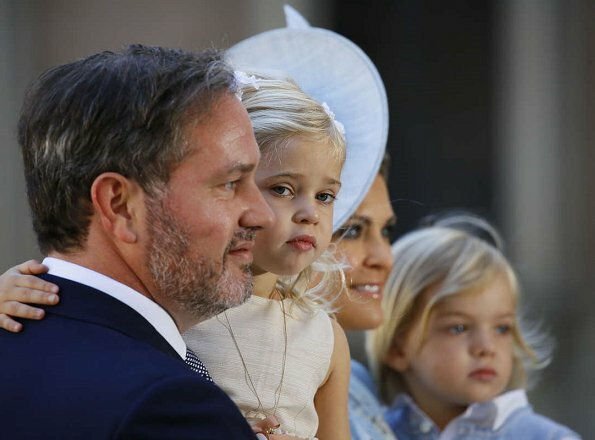 Also Madeline and Sofia manage very well, also nice hats. Silvia´s dress is nice color but a little meh. Kids are cute as always. 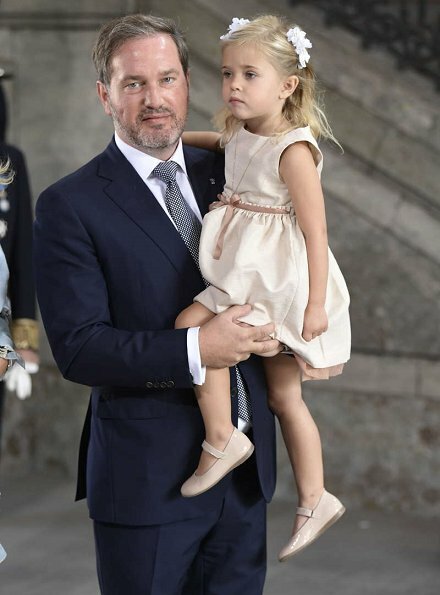 Estelle looks already so big girl, Oscar is serious one, Leonore is young version of Eva O´Neil, Nicolas is daddy´s clone. Lovely photos! Everyone looks amazing but I think Victoria is the winner in that gorgeous dress! 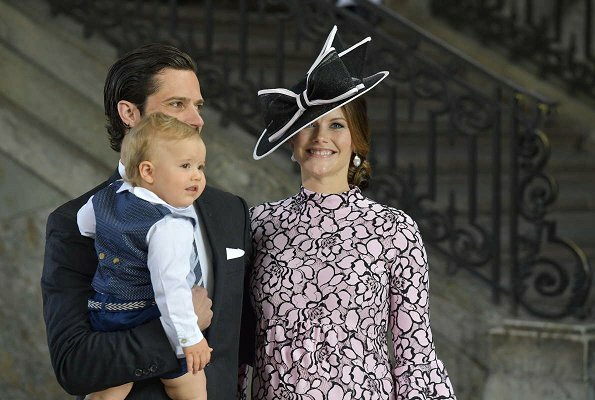 The kids are all cute and that photo of little Oscar hugging his mother is priceless. Oh I love seeing all these photos! 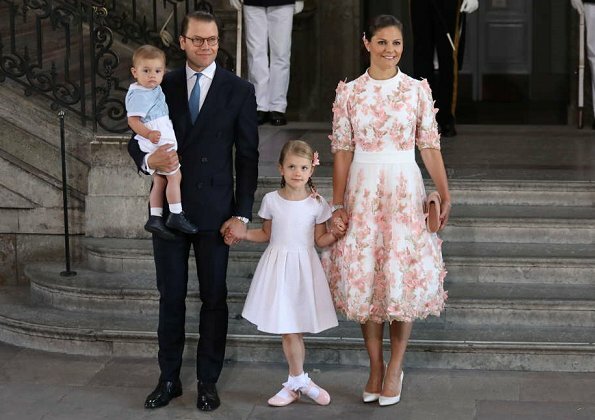 Such a lovely family, especially Victoria's. And her dress is beautiful and it looks gorgeous on her. 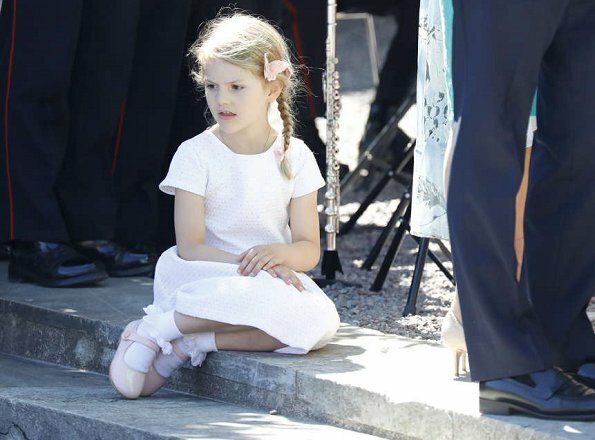 All the little children seem to be growing up so fast, especially Estelle! But I was wondering why Alexander was there when he wasn't on the guest list? I'm not complaining though, just curious. Victoria gets top marks, which she should being the birthday girl. She looks lovely - her dress is great. Sofia looks nice but I want to sort her hat out so she can see properly. 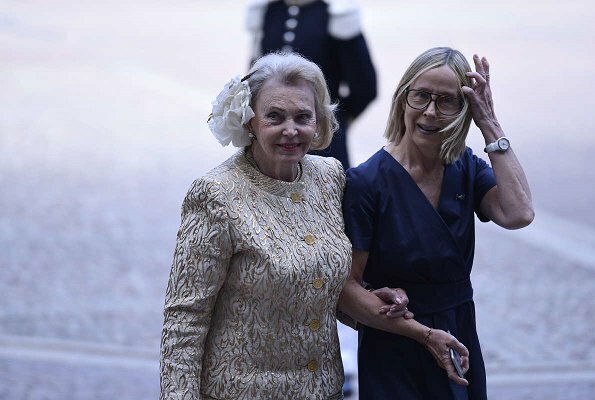 I personally find Madeleine's general style a bit matronly but she looks good and I like that shade of blue. Silvia looks fine if a little unexciting. 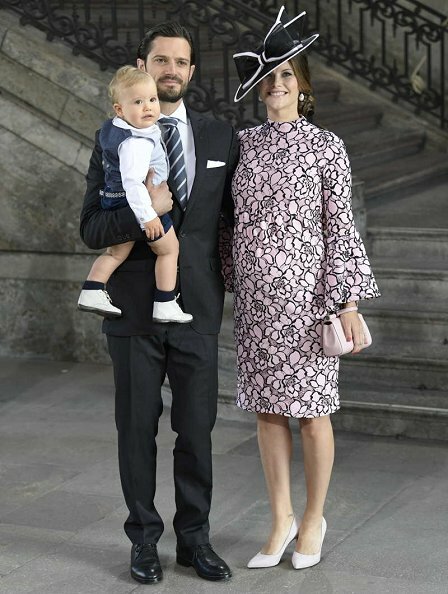 Love Estelle, Oscar is so serious and Alexander is just a cute little munchkin with those little cheeks. What a lovely family day. 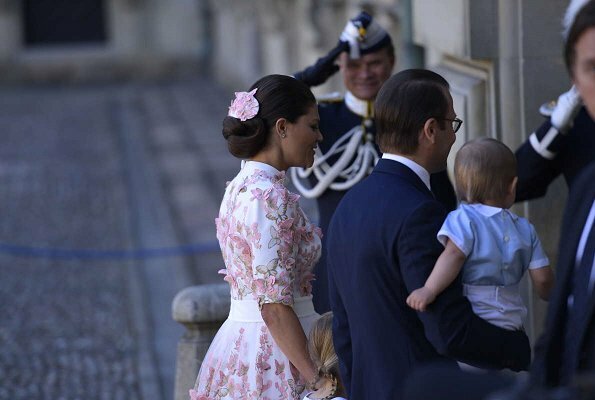 Did you notice one on the butterflies from Victoria's dress landed in Estelle's hair: ) ? Yes, beautifully thought-out family ensemble. Victoria looks lovely, even her hair is nice. All the children are very cute, love little Alexander! 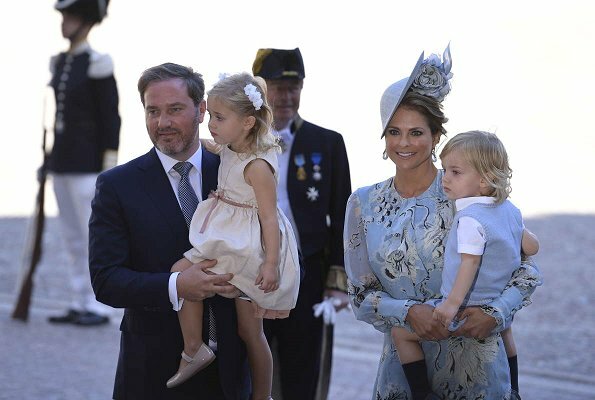 I don't like Sofia's hat, but oher than that they all look fine. Their husbands look very good. 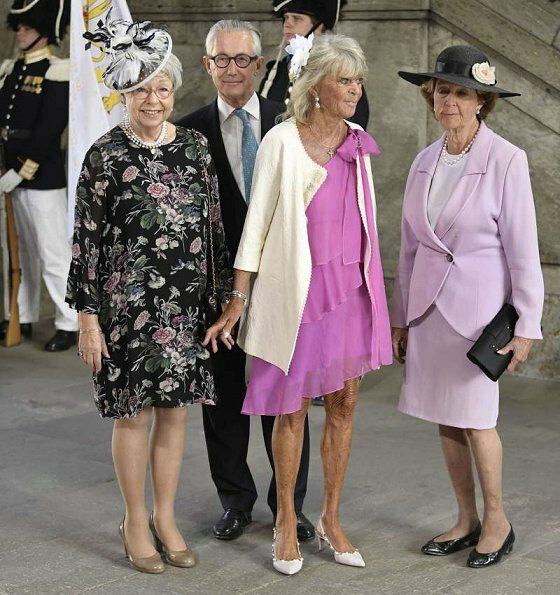 The lady in pink, I think is one of the King's sisters doesn't have the legs to show off in such a short dress. "liquacell", that Auntie got to much sun during her live in Marbella. You are right, she should have worn stockings, especially with those knees!!! 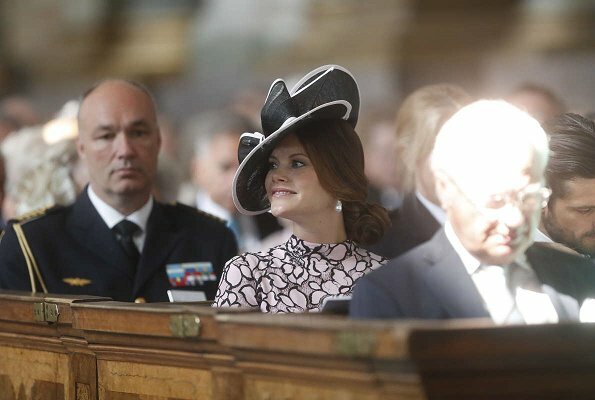 Sofia's hat is over the top, would look nice combined with classic black-white from Chanel, but not with that dress... Her little boy is really a cutie ;). Big celebrations for a birthday! 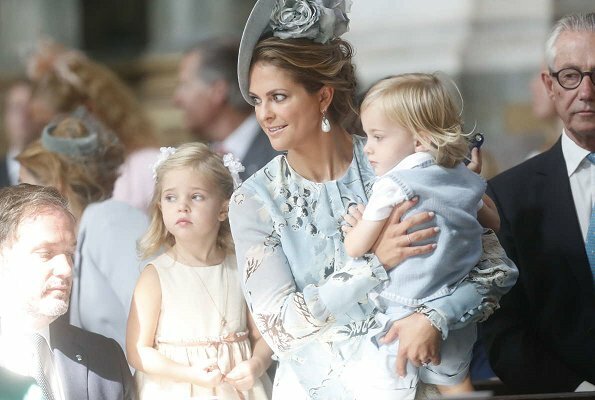 Princess Madeleine is the star!!! 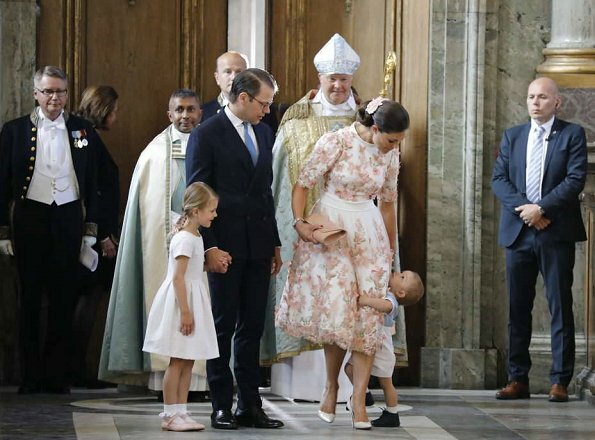 Beautiful and stunning with husband and children. I have to give credit to the birthdaygirl for her choice of designers. 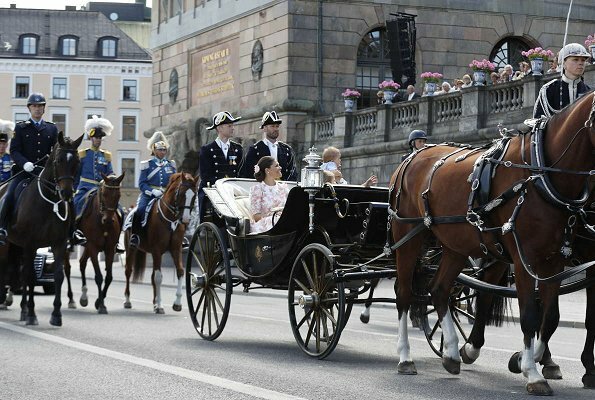 She mostly wears Swedish design -the Crown Princess is a great spokesperson for her country!